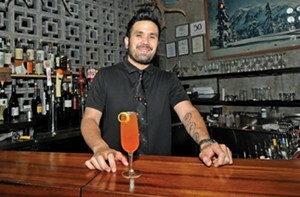 Sean Rapoza of Balliceaux says it has to be the Arnold Palmer. "But if you take that, and add some fresh herbs (like mint or thyme), and maybe a couple of crushed berries (strawberries and blueberries are nice), you've got a great lunch-party drink. At my bar, I'll mix up some fresh lemon, thyme syrup, blackberry purée, and top with club soda, a thyme sprig and a whole berry on top. Goes over well with pregnant women who want to hang out with their friends and be festive but can't imbibe booze. As for me, if I have to abstain, some hopped grapefruit bitters, club soda, and a slice of citrus refreshes on a hot summer night." Here's one of his recipes. Shake first three ingredients with ice, strain into an ice-filled collins glass and top with soda. Garnish and sip. All this for only $5!